The Pirelli Scorpion ATR is a on and off road all terrain tire. The Scorpion ATR is designed for trucks and SUV’s and delivers on road comfort and off road capability. The Pirelli Scorpion ATR can handle long trips, wet roads and rough terrain all while providing road comfort and handling. The Pirelli Scorpion ATR has a continuous center rib, stable shoulder tread blocks, and a silica enhanced tread compound that provide stability, and responsive handling. The Scorpion ATR also has circumferential grooves and shoulder grooves to help evacuate water and improve wet weather traction. 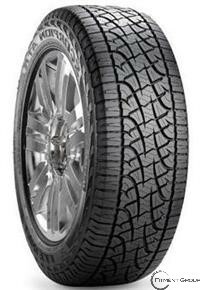 This Pirelli tires independent tread blocks and siping make the Scorpion ATR a capable tire on loose surfaces and in snow. The Scorpion ATR contains twin steel belts and is reinforced with nylon to provide a stable tread area and durability.